Representatives of three human rights non-governmental organizations (NGOs), a German-Kurdish organization Wadi, a U.S. based international organization Christian Peacemaker Teams (CPT), and Duhok based Alind Organization, conducted a two day visit on 15 and 16 August, 2014, to areas in the Duhok Governorate of Iraqi Kurdistan where Yazidi Iraqis who fled the violence of the Islamic State (IS) forces from the Shangal (Sinjar) area are now staying. The representatives spoke with an official at the Peshabur (Faysh Khabur) Iraqi-Syrian border crossing, who estimated that since 5 August more than 100,000 people came in seeking refuge. The representatives observed Yazidi families camping out under make-shift tents along the roads throughout the area, under highway overpass bridges, or in the open sided concrete buildings being constructed. They visited the displacement camp for estimated 2,000 (no official numbers are known) people in the Khanke municipality near the town of Semel, and the Bajet Kandala Refugee Camp, near the Peshabur crossing. At these camps they spoke with over 50 displaced persons and observed the current living conditions. The interviewed people shared many common experiences. Families reported men in their family killed and women raped or kidnapped by IS forces, escaping to Mount Shangal, watching relatives die for lack of food and water and suffering extreme heat exposure. Most of them arrived in the Duhok Governorate, after a combination of walking and being transported in trucks or wagons through the Kurdish controlled parts of Syria. They appeared deeply traumatized, and spoke of shame and despair about their future. The majority of the interviewees said they feared to stay in Iraq and wanted to emigrate to Europe, the U.S.A. or Canada. Khanke camp has been set up on a field next to a small town to care for the rapid influx of the displaced Yazidis. More than 100 white UNHCR tents are spread around a large field. People sat in the shade of the tents on cardboard or dusty mats. A local organization has delivered mattresses to a small portion of the residents. There were no water systems for consumption or bathing near the tents. Residents hauled water in buckets from a local school, but had bottles of water for drinking. According to the residents there were only two latrines. Local people of the town served the residents of the camp a warm meal about 5 PM, consisting of rice and bulgur. Apart from one police car, there appeared to be no security system for the camp, which might put especially women and Children in risk of abuse. People are in dire need of sufficient sanitation system, food, vitamins, medical attention as well as administration and security. Bajet Kandala Refugee Camp, situated just several kilometers from the Peshabur border crossing was meant to serve as a reception/transit camp for the Syrian refugees. In an older portion of the camp the visiting human rights workers saw canvas shelters, electricity, latrines, and water spigots. The other part, filled with several hundred white tents, has not been finished yet and the representatives have seen the ongoing enlargement. Residents of the new part, mostly families, had to cross a highly trafficked road to the rest of the camp to haul buckets of water and get a tray of what appeared to be subsistence amounts of cooked food, consisting mainly of rice. According to the administrator of the camp, a representative of the Kurdish Regional Government (KRG), around 20,000 people resided there as of 16 August. The camp is run by a KRG related agency that appeared to be overloaded and overwhelmed with the amounts of people present and still arriving to the camp daily. A 15-member family sitting under a make-shift shelter at the side of the camp told the NGO's representative that they had not eaten for three days. No international aid agencies were present at the camp. Help the Yazidi people of Shangal! 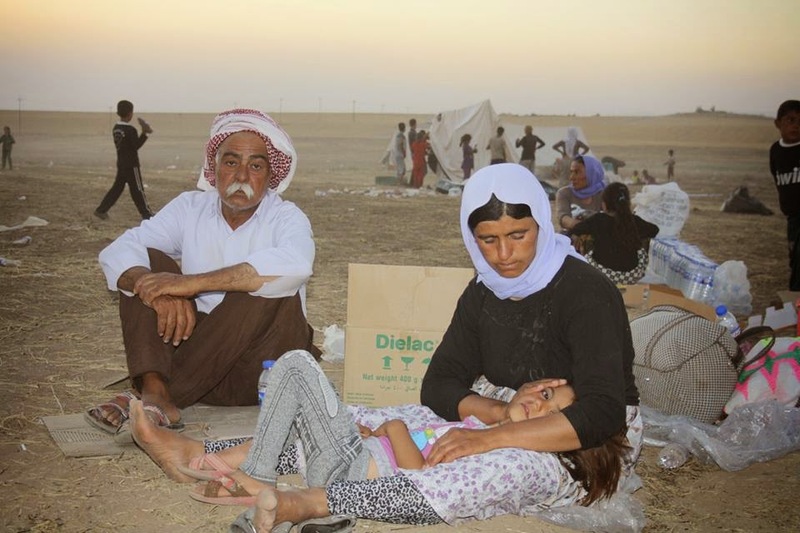 The Kurdistan Regional authorities along with local communities are doing much to provide help for those in need, but the region is overwhelmed by the enormity of the influx of the hundreds of thousands displaced Yazidis, Christians, Shabaks, Turkmen, Arabs and others fleeing the horrific violence perpetuated by the Islamic State forces. We ask the Iraqi government to act quickly and provide financial support from the central budget and try to find and release the missing persons, especially the women, remembering that Iraq signed resolution 1325 UNSCR in 2013 which calls on governments to protect women and children in conflict. We urge the UN and other aid agencies to act quickly to provide necessary infrastructure and basic needs and services, such as food, sufficient sanitation systems, medical care, and protection to people in the camps as well as to people needing shelter and housing outside of the camps. We urge nations of the world to open their borders for those displaced by violence and to provide a process for them to immigrate and the financial and legal assistance needed.